What NOT to Wear: Crocs. The title and the picture both say it. 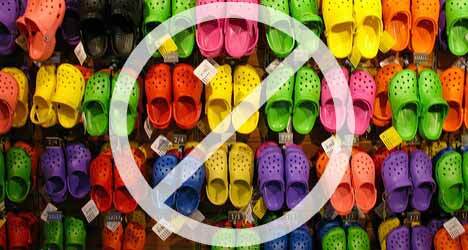 Do NOT wear Crocs. As colorful and intriguing as the picture may look, upon closer inspection, you see a giant "no-no circle" placed inconspicuously atop the many Crocs in the image. The facts are that they were meant to be bathroom shoes in Asia and that they are bathroom shoes in Asia. They're meant for a comfy no-slip shower in the bathroom, not for strolling the streets looking "extra-fresh" in those "slamming kicks." I will not lie though, I've heard they are very comfortable. I personally went to the nearest Crocs retailer and took them for a mini test run in the store, and yes, they are quite comfortable. But, I for one, would never sacrifice that much looks for comfort. There is definitely a limit to how much I'd sacrifice, and that's a very minuscule amount for me. Crocs are an instant "turn-off" should I say? No better way to word that, honestly. But that is my consensus.